It might only be March, but it’s never to early to start thinking about this year’s Halloween costume. Or, just your every day costume for heading out into the world and stuff, because if you had the choice to dress like a regular person, or dress like BB-8, you’d go with the latter, right? This past weekend at WonderCon our eyes found the most beautiful BB-8 costume we’re ever going to see. Yes, it was built for a small child, not an adult, but we can still dream, can’t we? And eventually someone is going to figure out how to make this in adult size, right? RIGHT? It’s so perfect for this world, everyone should have this BB-8 costume in their closet. 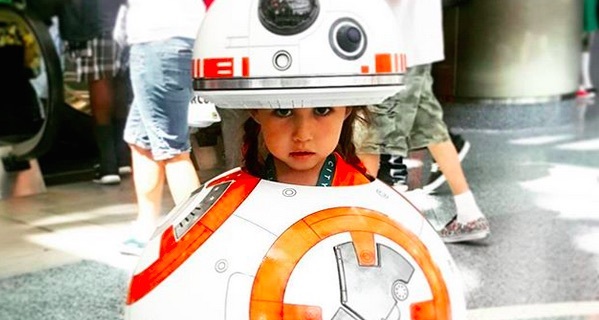 This BB-8 droid was designed by William Miyamoto and inside we’ve got his daughter, Kayla. Miyamoto and his wife are both cosplayers, and clearly, their little one wants to get in on the fun, too. Last year, she went as the Predator, and that’s amazing. This year, obviously needing to outdo herself, she suited up as Ray’s (and Poe’s) travel buddy. Since Kayla is clearly a pro at this, she didn’t just just walk around beeping and booping. Instead, she completely embodied BB-8, disappearing entirely into the costume. And then stuck a hand out to give thumbs up, just like BB-8! And know what happens when one BB-8 meets another BB-8? Magic. All of this is just an OVERLOAD of CUTENESS. This is exactly the droid we’ve been looking for FOREVER.